Welcome to Room 7 2013! 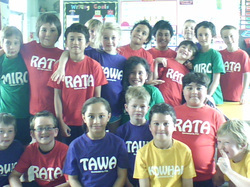 A snapshot of our Wanganui Explorer camp!! Today is cross country day! We are room 7 and we are excited and nervous! We are going to try our very best, wish us luck! At the moment we have four ladies come in from the Splash Centre to help us learn how to swim. It is heaps of fun! They are really helpful and kind. They help make us feel safe in the water. We went on a scavenger hunt to find things from the world around us, that we thought were special and unique. We discovered that the closer we looked, the more beauty we found! 200 + 40 + 8 are EASY to solve!